Congratulations to Brother Dave Eppley for his many years of service to our Masonic family and community. 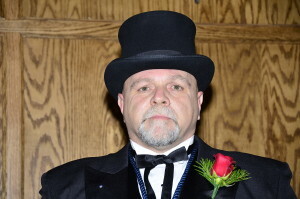 He received the Hiram Award on September 20, 2015 at Western Star Lodge #2 in the presence of many friends and family. Western Star has been busy for the last couple of months. Our third degree ritual team competed for the district ritual competition but fell just short of a win. I am proud of all our members for their hard work and dedication. I would also like to congratulate Brother Zackary Backus and Brother William Goodson who are the newest Entered Apprentice Masons in the month of August. Brother David Eppley will also be receiving the Hiram Award which is the “Highest Honor” which can be presented by a lodge. September looks to also be a busy month as we will be initiating Mr. Martin Woodley and Mr. Ryan Morrison to the degree of Entered Apprentice Mason. We will also have our annual community Dinner and a Movie on September 19, 2015. September 1, 2015 will be the next Stated Meeting at 7:30pm; Dinner will be served at 6:30pm families are invited to attend. September 15, 2015 will be a 1st degree. September 19, 2015 Dinner and a Movie. September 20, 2015 Hiram Award Ceremony for Brother David Eppley. September 22, 2015 Hall association meeting at 6:00pm 1st degree to follow at 7:30pm. Western Star Lodge Officers continue to work on their ritual work for the next masonic Year. The Line Officers are working towards their advancement and the move to their next place in the lodge. Western Star will be holding their Installation of Officers on December 12, 2015. Brother Robert “Skip” Glenfield is in the Transitional Care and Rehabilitation Canyonwood located at 2120 Benton Drive, Redding, CA. 96003. Please take time to go by and see Brother Skip as he makes his journey to recovery. Meet on the Level, act by the Plumb, and always part upon the Square.